DiscountPatio.Com warrants its products from manufacturer’s defects from the date of purchase. The warranty periods stated are limited to the original purchasers, exclusively for residential applications. 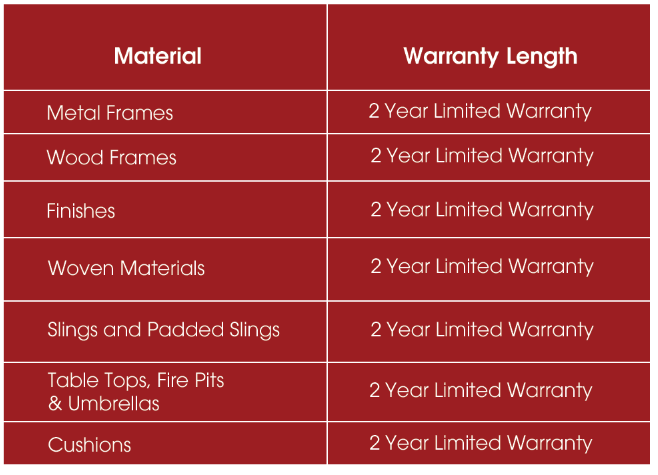 Please contact one of our locations for warranty information for specific pieces. Essentials Collections are ideal for low to moderate use. 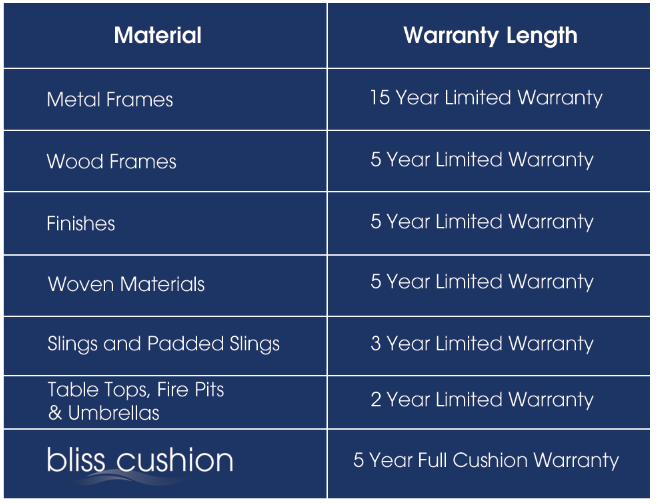 They are easy to assemble, made with powder-coated frames for added durability, and finished with comfortable cushions upholstered in durable outdoor fabrics. Essential Collections are the ready-made remedy to an empty patio in one simple package. Our Signature Collections combine designer details and premium materials, making it ideal for the discerning customer and feature our Bliss Cushions. Here you can experiment with even more options - including our full range of fabrics and button accents. No detail is overlooked with this collection - from the handfinished, powder coated frames to the incredibly plush cushions upholstered with your choice of designer inspired solution dyed acrylic fabrics. Signature Collections offer the same craftsmanship, incredible durability and chic sophistication of an expensive outdoor catalog without the outrageous price tag. PLEASE NOTE: Warranties do not cover failures due to freight damage, abuse, neglect, and improper maintenance, acts of nature (including wind damage) or owner modification.